When I purchased a gigantic piece of framed "art" from a thrift store, I thought I would toss the 3-ft by 3-ft picture and repurpose the frame. But when I saw what Rhonna Farrer could do with a chalkboard, I was inspired. I painted over the hideous '70s floral print and made my own chalkboard. Now I'm no Rhonna, but I do have a few tips to share to create your own chalkboard art. Use a mix of fonts. Mix serif, sans serif, script and display fonts for an eclectic piece that will really stand out. Shade with a light hand or draw thin lines to create dimension. Little details can make a big difference on the most simple of text. You don't have to be Van Gogh to add artistic elements. Simple hearts, arrows, or stars can complete a piece. Remember, it's supposed to look handmade. My daughter and I go through the Rapunzel/Mother Gothel routine from Tangled every morning when I drop her off at school. I always finish with, "I love you most" so this quote is pretty special to us. Still not convinced you can do this yourself? Trust me, you can! Chalkboard is the perfect canvas for the impatient artist who messes up a lot. (Not that I'm describing myself. Ahem.) Instead of having to paint over a mistake and wait for it to dry before fixing it, you just take a damp microfiber cloth and wipe that boo-boo away! It's dry in seconds and you can get right back to sketching. 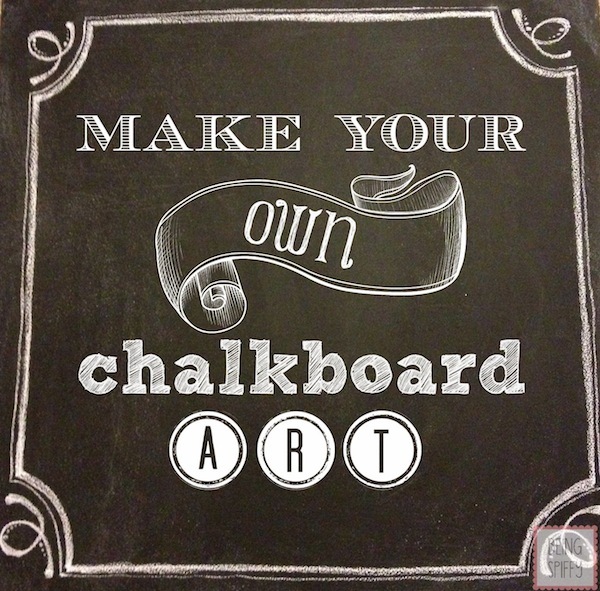 Are you ready to make your own chalkboard art? What quote would you display in your home?